Accumulated dryer vent lint causes so many fires each year that the U.S. Fire Administration (FEMA) has actually developed outreach and awareness materials on this topic, including posters, free reports, and even social media messages. Yet nearly 3,000 fires still occur each year for this reason. More than 100 injuries, an estimated five deaths, and $35 million in damaged property stems from this simple yet neglected home maintenance task. And the most risky time of year is in the cooler months of fall and winter. In this post, learn how and when to clean your dryer vent and potentially save lives. A Brief Introduction to Dryer “Lint"
Do you know what comprises the "lint" you occasionally see piling up in your dryer's vent? Lint is not just clothing fibers but also includes dust and fibers from the water, air, and atmosphere, as well as other debris that may enter through the exhaust vents. Unfortunately, the lint in your dryer's removable filter is just the surface lint you can see. No matter how efficient your dryer's filter is, it will never be able to catch all of the lint your dryer produces. What this means is that, behind the scenes, there is plenty more lint still traveling throughout your dryer system. Even worse, this lint is located in much more dangerous places, like near your dryer's exhaust vents, around your dryer drum (the large space where the clothing sits as it tumbles dry), and in your dryer's vent ducts. This lint tends to be more compacted, almost cake-like, and closely formed to the surfaces it lines. 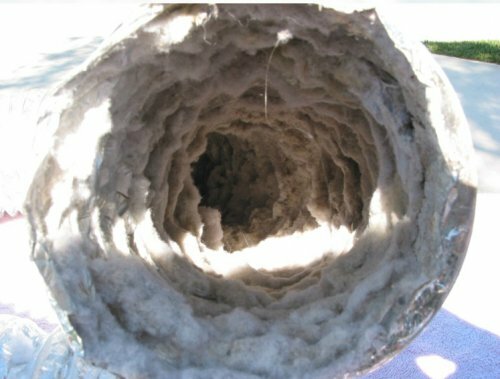 If allowed to build up for long enough, this "invisible" lint can actually close off ducts or exhaust vents, causing fires to start. There are four primary costs that arise from not cleaning your dryer vents. Each of these costs builds on the others and also worsens the others, as you will see. Due to the accumulating lint, your dryer will have to work increasingly hard just to do the same work. As your dryer works harder, it will begin to pull more and more energy, increasing your monthly utility bills. As your dryer loses efficiency, the dry time will also increase. And here we are not just talking about a few minutes' difference—you can potentially shave a half-hour or more off your regular dry time just by cleaning out your dryer vents! Most critically, your dryer will become one of the top dangers to your home and family. In fact, FEMA cited a simple "failure to clean" as being directly responsible for 34 percent of dryer fires in residences nationwide. What in Your Dryer Needs Cleaning? Vent ducts. Your ducts are the flexible tubes that lead to the hard exhaust pipes. These ducts can accumulate a thick inner layer of lint that can be vacuumed out for safety. Around the main tumble drum. The tumble drum in which you put your clothing to dry can also develop a thick coating of lint around the exterior of the drum itself. Near and in the exhaust pipes. Not only can lint from within the dryer system accumulate near and in the exhaust piping, but external matter from rodents, birds, and the "great outdoors" can also enter to clog up the pipe vents. These clogs represent one of the major fire hazards of your clothes dryer. In the lint trap. Most people know about the lint that can get trapped in the trap filter—this is what the trap is designed to do. But cleaning the lint out of this trap is just the start of the work needed to keep your clothes dryer from becoming a fire hazard. Once you understand just how dangerous a lint-clogged clothes dryer can be and where the lint and debris is most likely to accumulate, the final step is to ensure your dryer vents and mechanism gets cleaned regularly. The type of dryer you have, its location, your do-it-yourself comfort and expertise levels, and the length of time the dryer has gone without cleaning and maintenance will all factor in when deciding how to proceed with cleaning it. Clean it yourself. If you are simply doing light maintenance cleanings and all the relevant areas are easily accessible and you have the proper cleaning equipment, it is certainly possible to clean your dryer vents yourself. If you bring in an HVAC service professional for an annual cleaning, they can guide you in how to do smaller maintenance cleanings yourself to save funds. Hire a pro to clean it. If you don't know how long it has been since your dryer has been given a thorough and complete cleaning (if ever), it is a very good idea to bring in an HVAC professional at least for the first full dryer cleaning. This choice will also give you the opportunity to have the HVAC professional identify any other potential fire hazards related to your clothes dryer, including how the exhaust pipes are positioned and whether any of the internal parts are worn or damaged.